(Boneset (Eupatorium perfoliatum) - 01) While taking one of our walks, we spotted this small patch of boneset growing on the side of the road. 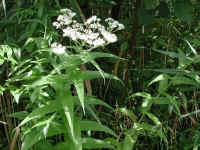 It stood about two feet in height, but bonesets have been known to grow to heights of five feet. (Boneset (Eupatorium perfoliatum) - 02) This photo gives us a slightly closer look at the numerous flowers that grow in flat- topped, terminal cymes. 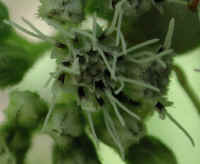 Each tiny bud opens into separate composite flowers that are frilly in appearance. 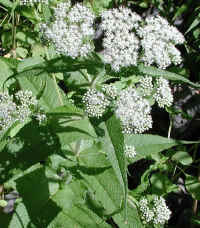 (Boneset (Eupatorium perfoliatum) - 03) The lanceolate, finely toothed leaves of the boneset grow opposite one another and are often united or fused together at the base where they grow from the stem. (Boneset (Eupatorium perfoliatum) - 04) Within each small bud, as seen in the previous photos, there is a package of tiny buds that open into individual flowers. (Boneset (Eupatorium perfoliatum) - 04a) In this photo of a boneset flowering cyme, we can see some of the individual tubular flowers sprouting forth from their buds. 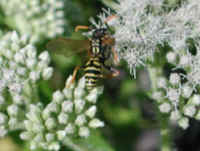 (Boneset (Eupatorium perfoliatum) - 04b) This small wasp came to enjoy the nectar and pollen that the boneset flowers were offering. 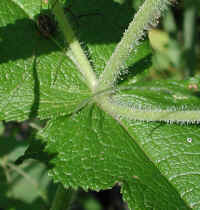 (Boneset (Eupatorium perfoliatum) - 06) In this close-up photo of the boneset leaves and stems, we can see the hairiness of the stems, the toothed leaves, and how the leaves clasp one another on opposite sides of the stem. 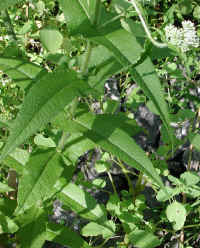 (Boneset (Eupatorium perfoliatum) - 07) This is a photo of boneset leaves that have fused together, which gave early herb doctors the idea that the plant had the power to fuse broken bones back together. 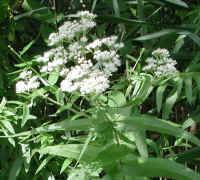 Thus, they used to wrap dried boneset leaves into bandages in the belief that it would help heal the broken bone. (Boneset (Eupatorium perfoliatum) - 07a) This is a close-up of the fused leaves that led to the scientific name of this wild flower. 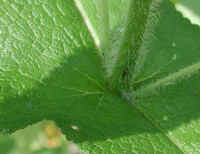 The Latin words "per," meaning "through," and "folium," meaning "leaf," were combined to describe the stems growing through the fused leaves of the boneset. (Boneset (Eupatorium perfoliatum) - 07b) The lighting in this photo revealed that there are tiny little hairs on the surface of the boneset leaves. 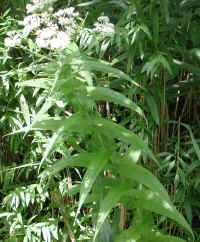 (Boneset (Eupatorium perfoliatum) - 08) This photo gives us a good view of the way the boneset leaves grow opposite one another and alternate their direction by ninety-degrees. 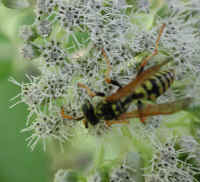 (Boneset (Eupatorium perfoliatum) - 09) This is a closer look at the boneset's visiting little wasp. (Boneset (Eupatorium perfoliatum) - 09a) In this wasp's eye view of an individual boneset composite flower, we can see the separate flowers that make up the composite flower. (Boneset (Eupatorium perfoliatum) - 09b) This is another wasp's eye view of the boneset composite flowers. 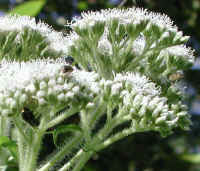 Bonesets bloom from August through October. 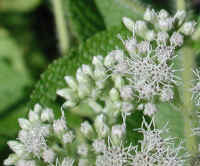 (Boneset (Eupatorium perfoliatum) - 10) This is another close-up look at the boneset flowers. Our friend wasp's head and leg can be seen in the upper right of the photo. 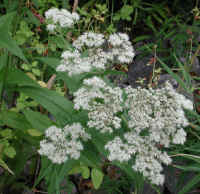 (Boneset (Eupatorium perfoliatum) - 10a) This is an approximately fifty times enlargement of a boneset composite flower. (Boneset (Eupatorium perfoliatum) - 11) This is a wasp's eye side view of a boneset composite flower. 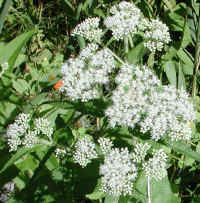 (Boneset (Eupatorium perfoliatum) - 12) These boneset flowers are nearing maturity. 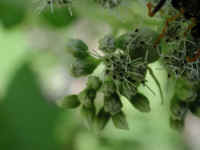 The dried flower tops and leaves were used by herbalists to make a tea for treating colds and an illness called breakbone fever, which seems to be similar to grippe. 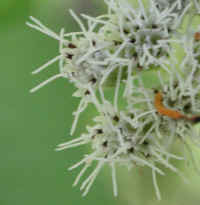 (Boneset (Eupatorium perfoliatum) - 13) This side view of a boneset shows the multiple branching that forms the flowering cymes. (Boneset (Eupatorium perfoliatum) - 13a) This is a close-up side view of the boneset cymes. 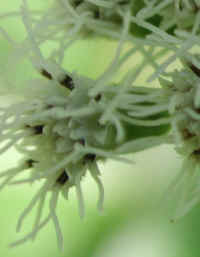 Remember that each one of the tiny buds develops into numerous flowers. 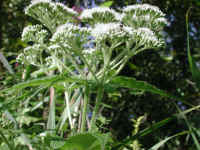 (Boneset (Eupatorium perfoliatum) - 14) These boneset flowers are just past the peak of their blooming season. Some of the flowers are just beginning to shrivel up. 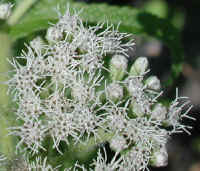 (Boneset (Eupatorium perfoliatum) - 15) This is a closer look at the boneset flowers as they begin to fade. (Boneset (Eupatorium perfoliatum) - 16) These four foot high boneset were growing along the side of the road. 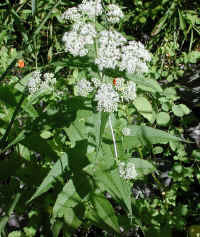 (Boneset (Eupatorium perfoliatum) - 17) We have not noticed any significant difference in the size of the flowering heads of short or tall boneset. 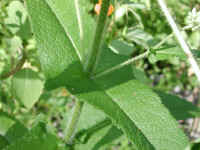 The only difference appears to be in the height of the stem and the number of leaf sets. (Boneset (Eupatorium perfoliatum) - 18) This in a closer look at the boneset flowers.